Not much to report. The only state poll is Maine, but it is interesting. Kerry and Bush are tied at 43% each. This result is bad news for Kerry, who expected to win Maine easily, as Gore did in 2000. 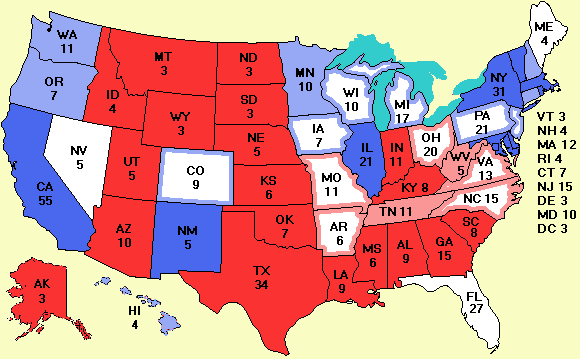 Maine is one of the two states that does not use a winner-take-all system for allocating its votes in the electoral college (Nebraska is the other one). The winner of each of the two congressional districts gets one, and the statewide winner gets the other two. The poll did not break down the results by CD. Also noteworthy in Maine is that 43% of the voters say Bush deserves another term while 55% say it is time for someone new. This finding suggests that a lot of people there dislike Bush but are not sure Kerry is the answer. Finally, although the people of Maine are not so hot on George Bush, they definitely like bear-baiting. The referendum on banning it is losing 52% to 35%. I think bears should be allowed to vote on that one. Zogby did a survey among rural voters. The good news for Bush is that he is ahead 52% to 37% in this demographic group. The bad news is that in 2000 he led 59% to 37% at this point. Jobs, terrorism, Iraq, health care, and education are the top issues down on the farm. Not surprisingly, those rural voters who see jobs as the most important issue prefer Kerry and those who see terrorism as the key issue prefer Bush. I have it on good authority that overseas voters are registering in huge numbers this time, maybe double or triple 2000. I was told that the number of people who showed up at the Democratic party caucus in England earlier this year was 10 times what it was in 2000, ditto in other countries. Americans overseas vote in the state they last lived in, even if that was decades ago. There are about 7 million overseas Americans and probably about 5 million are over 18. In Florida, it was the overseas absentee ballots that swung the election. I believe that something like 8% are military, but the rest are students, teachers, artists, government workers, business executives, spouses of foreign nationals, missionaries, retirees, and more. What is significant here is that these people represent a lot of votes and are not included in any of the polls. Nobody knows if they are largely Democrats or Republicans, but their votes could be one of the big surprises of this election. if anyone has any actual data (as opposed to speculation) on this group, I'd be interested.